Visit Cinque Terre Trails and Borgo Storico di Corniglia for their historical value. Get some cultural insight at Portovenere and Santa Margherita di Antiochia Church. Spend the 17th (Tue) exploring nature at Parco Nazionale Cinque Terre. There's lots more to do: trek along Footpath Monterosso - Vernazza, take in the spiritual surroundings of Church of San Giovanni Battista, admire the striking features of Chiesa Di San Pietro, and step into the grandiose world of Castello Doria. 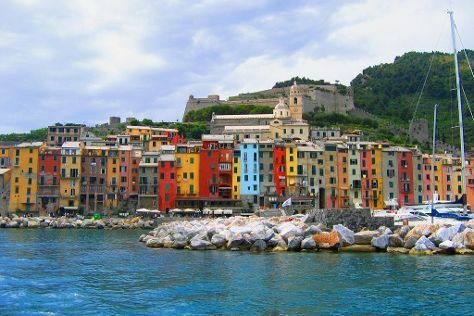 To find reviews, other places to visit, maps, and other tourist information, read Cinque Terre trip planner . Lisbon, Portugal to Cinque Terre is an approximately 7.5-hour combination of flight and train. You can also do a combination of flight, bus, and train; or drive. You'll lose 1 hour traveling from Lisbon to Cinque Terre due to the time zone difference. Expect a daytime high around 30°C in September, and nighttime lows around 17°C. Finish your sightseeing early on the 18th (Wed) to allow enough time to take a train to Genoa. Boccadasse and Cattedrale di San Lorenzo - Duomo di Genova are good opportunities to explore the local culture. Passeggiata Anita Garibaldi a Nervi and Chiesa dei Santi Vittore e Carlo will appeal to history buffs. Take a break from Genoa with a short trip to Baia del Silenzio in Sestri Levante, about 52 minutes away. Next up on the itinerary: meet the residents at Aquarium of Genoa, take an in-depth tour of Museo di Palazzo Reale, see the interesting displays at Palazzo Doria Tursi, and make a trip to Piazza Raffaele De Ferrari. To find photos, other places to visit, where to stay, and more tourist information, use the Genoa tour site . You can take a train from Cinque Terre to Genoa in 1.5 hours. Alternatively, you can drive; or take a bus. Traveling from Cinque Terre in September, Genoa is a bit warmer at night with lows of 22°C. Cap off your sightseeing on the 21st (Sat) early enough to travel back home.